The 2018 Subaru Legacy is one of only two midsize sedans to offer traction-enhancing all-wheel drive, and it's the only one to have it standard. 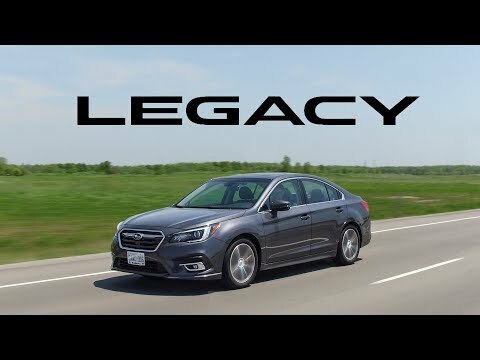 Far from a one-trick pony, the Legacy is well-positioned against better-known rivals like the Honda Accord and Toyota Camry with its excellent resale value and technology that now includes CarPlay and Android Auto as standard. I feel like Subaru has had awesome reviews in things like safety and customer satisfaction. When they towed my Malibu away they person doing so said they don't tow many Subaru cars away because there is great return on them and something you can take care of and hand down. I love my new Subaru Legacy because it is very similar to what I had previously only with a few extra features like the back up camera and lights in the mirror. I was able to get one with the moonroof and heated seats and everything. The color is a shiny blue which makes me happy that I found a color and not a dull earth tone. It is a great family car. The only thing I don't like about new subaru cars is they let the gas light come on way too early like still at a quarter of a tank which makes me want to ignore it longer and they bounce when you are at idle more than previous cars I've had. I am enjoying the new screen display and easy access to information like tire sensors and other maintenance things which I didn't have before. The interior color is really nice too and the seats seem comfy. I love my Legacy - perfect for Oregon, rain or shine! Good gas mileage, I love the safety features, the front detection feature has prevented 2-3 accidents that I can immediately recall at 20, 000 miles I still haven't experienced any mechanical or technical issues, other than alerting me to low tire pressure and the check engine light came on when my gas cap wasn't screwed on completely. The all-wheel drive has gotten me to and from work in snowy and icy conditions. The car seats 4 comfortably, or two up front with my great dane in the back:) lots of trunk space too! Great value for a superb vehicle! The Legacy is a great car for getting around town as well as traveling distances. We sat 5 adults in the car without any discomfort when traveling to a family event (took us about 45 min to get to our destination). We get great gas mileage with this car. Our previous car we would need to stop and gas up at least twice a week. With this car we can go for 2+weeks around town before needing gas. And the cost was very reasonable for this vehicle. Subaru will notify owners, and dealers will reprogram the combination meter software, free of charge. Interim owner notification letters are expected to be mailed December 17, 2018. A second letter will be mailed when the remedy is available. Owners may contact Subaru customer service at 1-844-373-6614. Subaru's number for this recall is WTW-82.